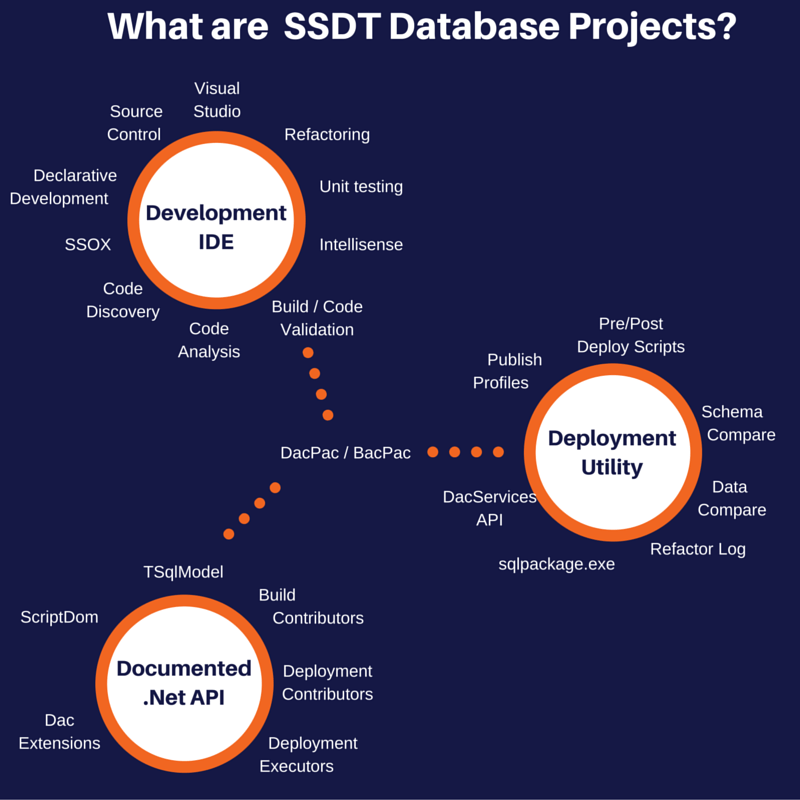 What I have done is created a picture of the parts of SSDT and I will write a little blurb and give one or more links to somewhere for further reading, I really hope that someone finds this useful as SSDT is a great tool that should be used by more SQL developers. The three major components in SSDT are linked together using dacpac’s and bacpac’s. The dacpac and bacpac are either the output from SSDT projects or exported from live databases. The files themselves are zip files which use the Microsoft “Open Packaging Conventions”. If you rename them to .zip you can extract them and see the contents. A dacpac contains the model which is enough information to be able to re-create both the DDL and DML of the database to be deployed. A bacpac contains the model but also contains data files with the table data in the BCP format. Having both the schema and the data means that not only the schema but also the data can be deployed. The first major category that we can break SSDT down to is that it is a development IDE, it has tools and utilities to help us write code and that can’t be a bad thing. Visual Studio is a great UI, the editing capabilities are excellent (things like alt+shift selecting lines and changing multiple lines at the same time and tabbing lines across together). The best thing about it though is that it is extensible so you can use tools like resharper or the redgate sql prompt or even your own extensions. In my case I use resharper and altought doing ctrl+n (with the resharper keyboard mappings) will not find t-sql objects it does find files so as long as you name each file the same as an object it is super easy to navigate around a project. If you do not have a license for Visual Studio then you can use the free express version or the Visual Studio shell which is good but you can’t add extensions. If you are working on a community project or part of a smaller company then you can use Visual Studio Community edition which is the same as the Professional edition but is free. You do not strictly have to use source control to use SSDT but you do need to get your DDL and DML into at least one text file and have that in the file system so you may as well use source control as you effectively get it for free. The traditional way of writing code for SQL Server, either the underlying schema so tables and indexes or the code i.e. stored procedures and functions etc. is to take an existing database (even an empty one) and make incremental changes to it until it ends up how you want it. Even writing this sounds like a waste of time but I digress. If you use SSDT and the declarative approach then your work is done, if you use the traditional approach then you need to work out how you want it to look like (done) and then the steps to go from the first version to the second. find all the references to the old column and change them to the new one (hopefully there won’t be many ? On top of this as well as storing this update script you need to make sure you still have the definition from which you changed to apply the script to. You should also make it idempotent so you only actually try to make the changes if they haven’t been run before. Alternatively use the declarative approach in SSDT and not worry about any of that. This is a talk by Gert Drapers, he is the grandfather of SSDT, go listen to him tell you a bedtime story. There hasn’t been much written about the SSOX but it is really cool, go check it out. I have an article at Simple Talk that is waiting to be published, when that happens I will put the link here. What I mean by this is you can find code easily, you can right click on an object name be it a table or function or whatever and jump to the definition. You can also do the reverse you can right click on an object and find all the references. This reference discovery is really useful as you can get examples of how objects are used within the project and get an idea of how wide ranging a change to it would be. If you write a stored procedure that references a table that does not exist it lets you merily deploy it but in SSDT you will not be able to build the project. This is huge for SQL developers as it drastically reduces the risk of a typo causing a runtime error at a later date. The code analysis in SSDT ranges from validating that the syntax is correct for the specific version of SQL Server your project targets (on the properties page you can set the version) to validating that references to objects are correct as well as providing some analysis rules and a framework to let you create your own rules. I also have an article coming out on simple talk about this so I will add the link when it is published. SSDT however comes with it’s own test framework which lets you write unit tests in VB.Net or C# – the tests run T-SQL and there are pre/post scripts you can run so if you can do it in SQL Server you can test it using this. We shouldn’t really have to have this discussion but if you are developing without intellisense then you may as well develop in notepad – you can do it but it is not efficient so don’t do it. Intellisense completes words etc what do you want to know more than that? This is where SSDT really gets interesting, instead of a disparate set of tables and procedures each doing their own thing and possibly generating runtime errors you cannot build an SSDT project with invalid code. The example I always give is of the stored procedure that runs at the end of each year which relies on a table that has been modified, the traditional method of writing T-SQL does not stop breaking changes and because not many SQL developers write unit or integration tests it is unlikely that any issues would be found until the critical year end. If you have an error in the SSDT project the project won’t build – so you must fix it before you can move on. If you project does build then it creates a dacpac which is effectively the binary output format that can be used to deploy changes to actual databases. I couldn’t find anything that talks about the SSDT build and verification process – if anyone has a link let me know and I will update it or maybe write something myself. That is it for part 1, in part 2 and 3 I will cover the deployment and api parts of SSDT. Any questions please shout and if anyone has some better links please feel free to send them to me and I will update this.